Windows 8 Manager is all in one tool for Windows 8, which allows you to optimize, tweak, repair and clean up Windows 8. One of the must have tool for Windows 8 users, that will increase your system speed, improve system security and eliminate system faults. Click what you want to improve on your Windows 8 PC, such as Security, Network, Optimizer, and so on, and you’ll come to a screen full of options. Windows 8 Manager has more than 30 different utilities in one and help your system faster and more stable. 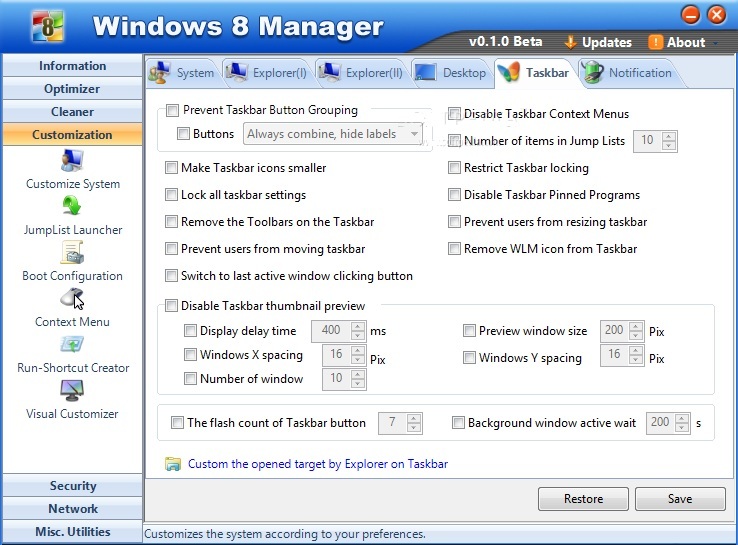 All you need is to install the Windows 8 Manager and after that you can do all these tasks easily one by one. Windows 8 Manger has 7 tools and they are Information, Optimizer, Cleaner, Customization, Security, Network and Misc. Utilities. All these tools have diffrent features which are really useful to optimize and tweak up your Windows 8 PC. In Information Tab you can get all the details about your system and help you find out the installation key of Windows, show all detailed information of running processes and threads on your machine. 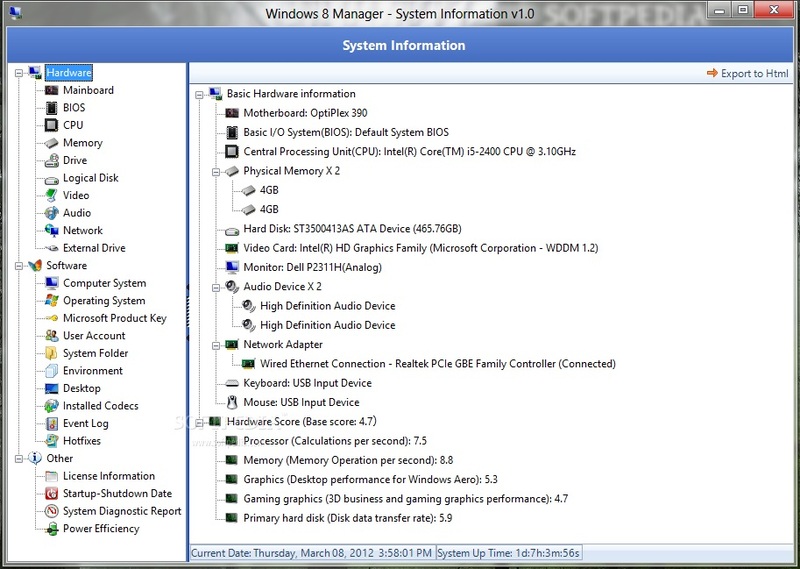 Optimize and Cleaner option help you to optimize your Windows 8 PC. Help you to Tune up and optimize system and Task Schedule, on the other hand Cleaner allows you to find and clean junk files to increase Hard Disk space. It has also some best tool like Desktop Cleaner to clean your desktop files and Registry Defrag to rebuilds and re-indexes your registry to reduce registry access time. Customization options let you configure system settings from here you can tweak system Explorer, Desktop, Start Menu, Taskbar and notification area, Create the quick startup items on Taskbar with the Jump List launcher and create run-shortcuts and customize the system visually. Windows 8 Manager will work only on Windows 8 PC and available for both 32-bit and 64-bit versions of Windows 8. 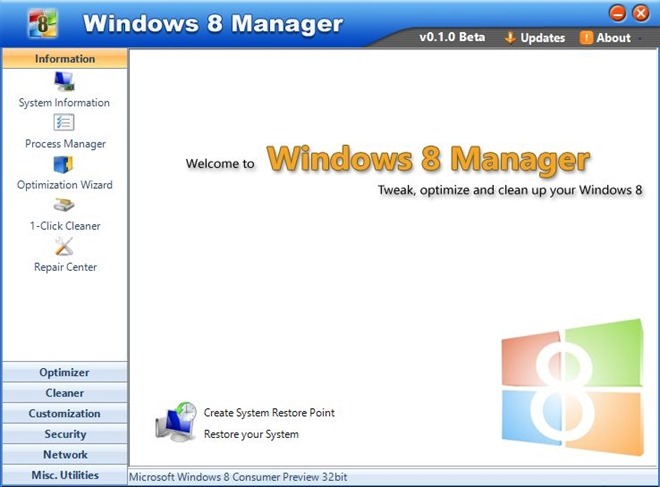 Try windows 8 manager and optimize, repair and tweak your new Windows 8 PC.